Have you discovered garden podcasts yet? They’re like a radio programme which you can download from the Internet and listen to, at any time, on your smartphone or computer. But – with a few exceptions – the exciting ones are now done by individuals rather than companies. I’ve been talking to three podcasters. Jane Perrone runs a podcast about house plants called On the Ledge. It’s one of the most successful and well established garden podcasts around. 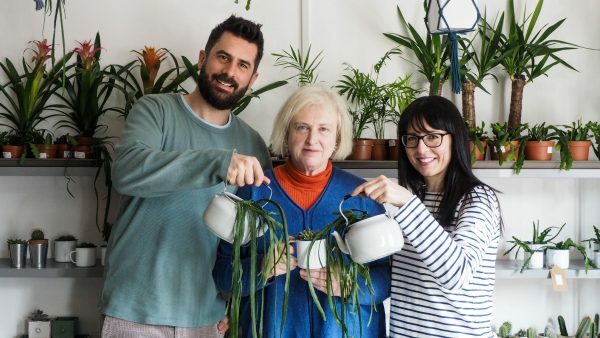 Jane Perrone’s podcast On The Ledge specialises in talking about house plants. Peter Donegan’s award-winning The SodShow is probably one of the longest-running UK garden podcasts. 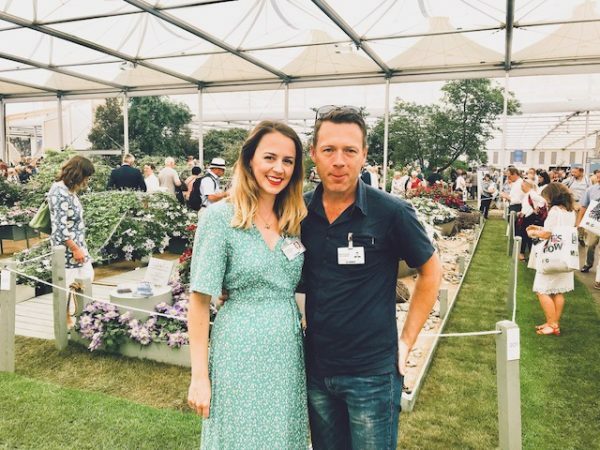 He interviews interesting people from the gardening world – from head gardeners to garden designers and more – every Friday. ‘I’m an old boy in terms of garden podcasting,’ he jokes. And I’ve also interviewed Michael Perry and Mary Ellen who have just started one of the newest podcasts, The Plant Based Podcast. 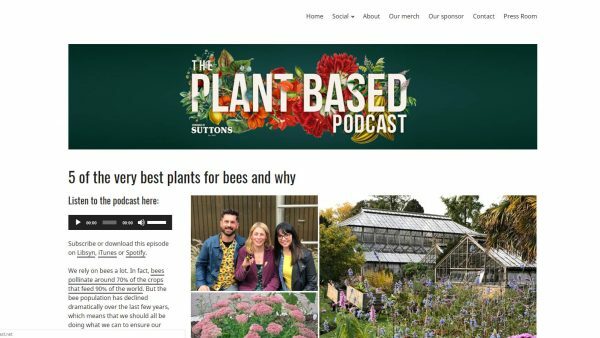 So what has changed for garden podcasts? The RHS has two podcasts, one of which is the award-winning The Garden Podcast. But many of the best podcasts are now made by and for individuals who are passionate about a particular kind of plants or gardening. Garden podcasts can be more specialist than radio, TV, magazines or newspapers could afford to be. There is a podcast, for example, called All About African Violets. Can you imagine any radio station being able to run a regular progamme about one kind of plant? He sees podcast interviews by individual podcasters as being more personal: ‘When you’re interviewing someone for a podcast, it’s as if they allow you into their rooms, and into their hearts,’ he says. He quotes a podcast he did with Pollyanna Wilkinson who was doing a show garden at Hampton Court, while feeling like a bad mother for being away from her child for two weeks. Garden designer Pollyanna Wilkinson being interviewed by Peter Donegan at the RHS Hampton Court Palace garden show. What makes garden podcasts different? Meeting Michael Perry and Ellen Mary of the Plant Based Podcast. 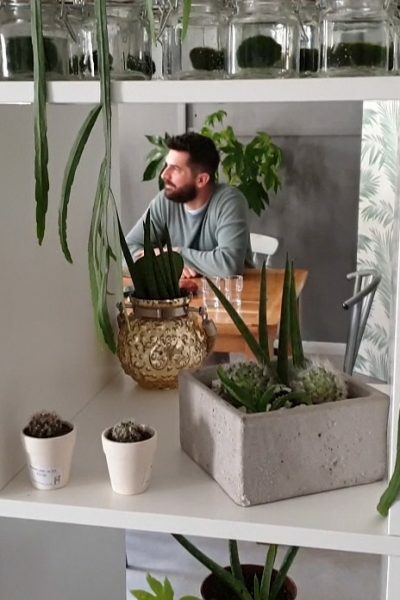 I interviewed them at the delightful Pretty Cactus online house plant specialist near Norwich. Podcast listeners, by the way, generally have a younger demographic than radio or TV, so this is a good way to interest, for example, Millenials in gardening. 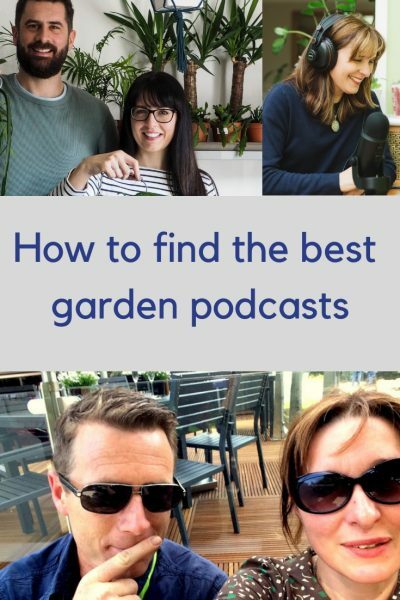 How do you find a good garden podcast? On the Ledge appears in almost all of them. Other regular chart toppers include Epic Gardening (practical advice on hydroponic and sustainable gardening), The Sod Show, The Skinny Jean Gardener (family fun in the garden) and the botanic expert In Defence of Plants. And The Plant Based Podcast got to no 1 in its category on iTunes after its first broadcast. 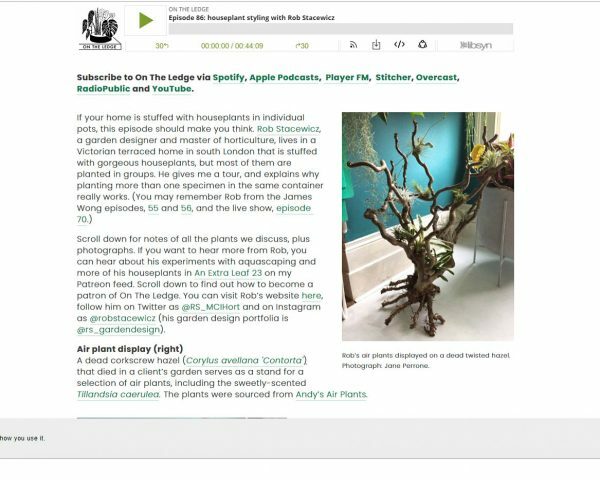 Magazines and newspapers often run ‘Six of the Best Gardening Podcasts’ type articles, such as this one by Gardens Illustrated. You can also put ‘gardening’ into the search box of the various podcast platforms, such as PlayerFM, Stitcher, Spotify and more. ‘Gardening’, by the way, comes under ‘hobbies’ in most of these. ‘And YouTube is also one of the biggest audio platforms,’ says Peter. In my opinion, YouTube’s search facility is better than the other platforms, so looking on YouTube is a good place to start. If you want to listen to garden podcasts for their individuality and specialism, then the charts aren’t always the best place to look. A podcast about a minority interest, such as African violets, is never going to appear in a chart. And the ‘search’ facility in most of the podcast platforms is…well, words fail me. (And it’s not often that happens). Unless I’m missing something. I tried to put ‘house plants’ into the ‘search’ box on PodbayFM and even iTunes..honestly, don’t bother. I am currently interested in begonias, so I tried this with ‘begonias podcast’. Episodes about begonias from many good major podcast shows came up, including On the Ledge and In Defence of Plants. Podcasters also often interview each other. So once you find a podcast that suits you, you’re likely to hear about others. 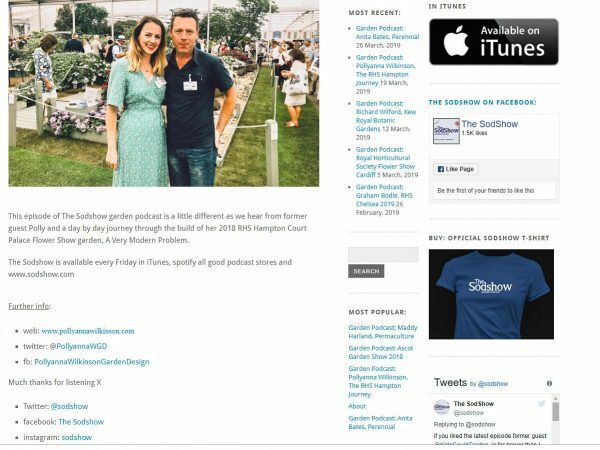 The SodShow, for example, has an episode featuring other garden podcasters. On the Ledge’s listeners have become a community. Jane says they comment or ask questions, either via social media, on the website or via Patreon. She encourages listener participation with things like the On The Ledge Sowalong (#OTLsowalong). She and listeners all sow house plants from seed, exchanging experiences. Listeners can also ask her questions about their house plants. They even meet up with each other. So how do garden podcasts make money? 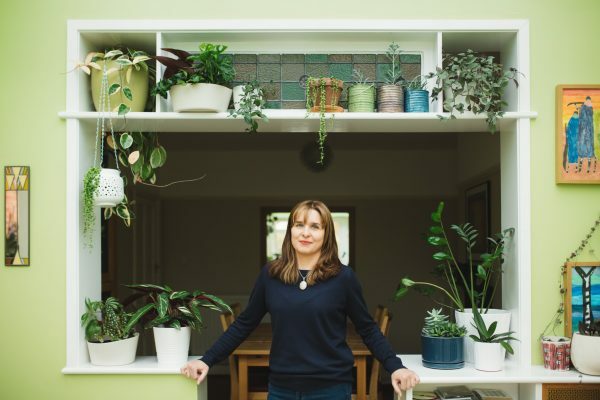 ‘Running a garden podcast isn’t the route to fame and fortune,’ says Jane. Sponsorship, advertising and donations are the three main ways a podcast is funded. You can support On the Ledge through Patreon. Patreon is a platform for supporting creators. You can either make a one-off donation (‘buy me a coffee’) or a monthly payment. There are several levels of monthly donation, each with ‘rewards’. For $1 a month, you can be a ‘Crazy Plant Person’ – the reward is knowing that you’re helping make the podcast possible. From $5 a month, you get access to exclusive content and so on. The principle of Patreon is that you can choose what or if you want to pay. And it’s also a way of acknowledging that what people do creatively – making videos, podcasts and more – is of value. There is sometimes a sniffy attitude to ‘making money’ in Britain. But if a podcast or video creator makes some money from their work, they can spend more time on it or buy more equipment to make the podcast better. Then there’s advertising, sponsorship and ‘merch’..
On the Ledge also takes advertisements, but relatively rarely, says Jane. And advertising is usually numbers-based, so a podcast would have to be very popular for ads to bring in much money. All three – the Plant Based Podcast, The SodShow and On the Ledge sell mugs, t- shirts or other branded merchandise. But such things do not appear to add up to a salary. However, podcasting can be a good way of raising your profile for other things you do, such as garden design, consultancy, freelance writing or giving talks. So should you start a podcast? ‘You should start a podcast’ is the sort of thing people say to each other now. If you’ve already got a blog, YouTube channel, Instagram following or have a small business, then someone will have suggested you podcast. Or they will, probably this summer. But, as Peter, Michael, Ellen Mary and Jane all testify, it’s a lot of work. And there’s a very steep learning curve. You don’t need expensive equipment. But you do need to get certain things right. Audio is key. Michael and Ellen Mary discovered that they couldn’t record in a car: ‘You really need a room with lots of soft furnishings to absorb sound,’ says Michael. They recorded another episode in a cafe and when they played it back, they found that the clattering of cups was a bit too intrusive. ‘Though very atmospheric,’ added Mary Ellen. Jane and other podcasters also interview people from all over the world. A crackling Skype connection is not comfortable to listen to, so there have to be backups and alternative ways of recording it. ‘You need to do a lot of preparatory work to make sure that it sounds natural but not scripted,’ she says. Most good podcasts also have websites with ‘show notes.’ That’s where you’ll find a version of the show that you can read, plus more resources, such as books and tips. And you can leave comments. That’s more work! The end result has to be edited. Then the whole podcast has to be publicised. ‘There’s at least as much work again in publicising each podcast episode on all the various social media,’ says Jane. If you are tempted, Jane runs a support group for gardening podcasters on Facebook. See this video for the interview on garden podcasts with Michael Perry and Mary Ellen. What are your favourite gardening podcasts? Let me know in the comments below! And do join us every Sunday morning – if you pop your email address into the box on the top right of this page, we will fly into your inbox every Sunday morning.